Knowledge of species geographic distributions is important for many applications in evolutionary biology, ecology, and conservation. Evolutionary processes, such as speciation, can be greatly influenced by spatio-temporal environmental variation. New developments in Ecological Niche Modeling have provided insight into understanding evolutionary and historical processes that generate and/or affect biodiversity. Geographic data for a species of interest can be coupled with high resolution climate data to predict species distributions and determine niche use. The resulting niche models represent the environmental conditions in which populations of a species can be maintained. The fragile nature of West Indian faunas today is exacerbated by the continuous disruption and loss of habitat. 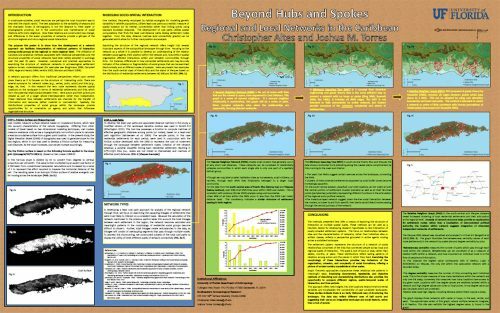 This study focuses on four endemic and codistributed bat species on the West Indies (B. cavernarum, B. nana, M. plethodon, and M. redmani). These species share similar habitats but show a distribution partitioned primarily as Greater (B.n. and M.r.) vs. Lesser (B.c. and M.p.) Antillean occupants. Habitat requirements for these species are not well known. 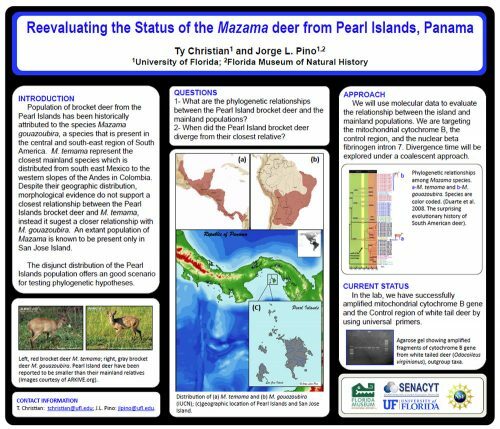 The population of brocket deer from the Pearl Islands has been historically attributed to the species Mazama gouazoubira, a species that is preent in the central and south-east region of South America. M. temama represents the closest mainland species which is distributed from southeast Mexico to the western slopes of the Andes in Colombia. Despite their geographic distribution, morphological evidence does not support a closest relationship between the Pearl Islands brocket deer and M. temama. Instead, it suggests a closer relationship with M. gouazoubira. An extant population of Mazama is known to be present only in San Jose island. The disjunct distribution of the Pearl Islands population offers an good scenario for testing phylogenetic hypotheses. Sucking lice (Phthiraptera: Anoplura) are permanent and obligate ectoparasites of eutherian mammals. These highly specialized blood-sucking insects live in close association with their hosts where they complete their entire life cycle. This relationship has led to coevolution in which parasite diversification parallels that of the host. The human head louse has coevolved with humans over millions of years. 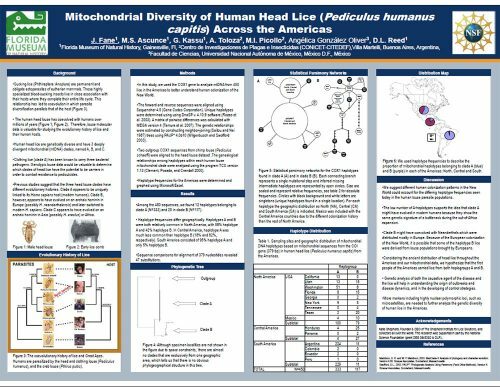 Therefore, louse molecular data is valuable for studying the evolutionary history of lice and their human hosts. In this study, we analyzed mtDNA from 442 lice in the Americas to better understand human colonization of the New World. Our current results show that in South America, Clade A is much more common whereas Clade B is more common in Central and North America. We suggest different human colonization patterns in the New World could account for the differing haplotype frequencies seen today in the human louse parasite populations. South America, for example, might have haplotype frequencies similar to that of Southern Europe, whereas North America might closely resemble Northern Europe. Neotropical singing mice (Scotinomys) are diurnal insectivorous rodents that inhabit montane cloud forests throughout Central America. Males commonly emit a series of rapidly repeated notes (“trills”) that serve to attract females and repel rival males. 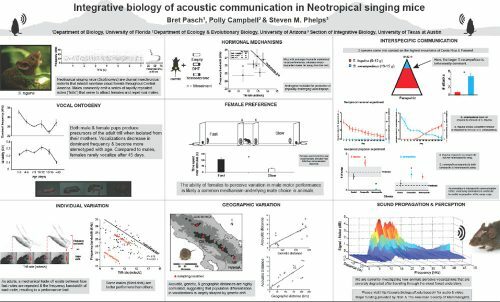 We are currently studying vocal ontogeny, individual variation, hormonal mechanisms, female preference, geographic variation, interspecific communication and sound propagation and perception. In small-scale societies, social resources are perhaps the most important way to deal with the chaotic world. The best adaptation to the variability of seasons and the stochastic forces of demography is not the distance to fresh water or physiographic province, but in the construction and maintenance of social relations with one’s neighbors. How these relations are constructed may change, and differences in the scalar properties of networks provide a glimpse of the structure regional and micro-regional social interactions. 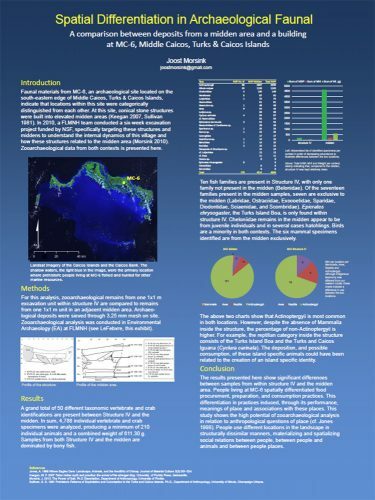 The purpose this poster is to show how the development of a network approach can facilitate interpretation of relational patterns of interaction among social groups at the regional or micro-regional level. The utilization of concepts and analytical methods associated with relational perspectives and the structural properties of social networks have been widely adopted in sociology over the past 25 years. However, conceptual and practical approaches to examining the structure of relational networks in archaeological settlement systems remain underdeveloped (for examples see Brughmans 2009; Campbell 2009; Hage and Harary 1996; Jenkins 2001; Munson and Macri 2009). A network approach differs from traditional perspectives reliant upon central place theory as it is focuses on the structure of interacting units. There are several synonyms for network nodes (e.g., vertex, point, actor) and links (e.g., edge, tie, line). In this research the term node represents discrete spatial locations on the landscape in terms of residential settlements and links which form the potential relationships between them. Here actors and their actions are viewed as part of a larger whole–interdependent rather than independent. These relational links between settlements are channels for the transfer of information and resources (either material or nonmaterial). Spatially, the distributional properties of social groups within the landscape provide opportunities for or constraints on agency and action that influences organizational structure. The methods presented here offer a means of exploring the structure of interaction at multiple spatial scales. These methods can be used as a heuristic device for developing research hypotheses to test interaction of locally situated settlement systems. The focus on relationships between sites and the characterization of networks, rather than individual sites or artifact classes, reflects a perspective grounded in active agents moving across a socialized landscape. The settlement pattern represents the structure of a network of social relationships comprised of the links that connected people across local and regional scales of interaction. This scale is one of hours or days, rather than weeks, months, or years. These distributions reflect lasting patterns of relations among actors and the places in which they lived. Examining the morphology of these interactions provides key indicators of the organization, cohesion, and complexity of social formations, offering a picture of ancient society unavailable at other scales. Graph Theoretic approaches characterize these relational site patterns in meaningful ways. Employing documented, repeatable, and objective methods of describing and characterizing distributions also provides the opportunity to compare different regions, spatio-temporal scales of interaction, and time periods. This approach offers new insights into site locations beyond environmental variables and emphasizes the connectivity of past socialized landscapes. These studies indicate there is an Early Ostionoid way of structuring the landscape. The data also reflect different uses of ball courts and suggesting their use as an integrative landscape and social feature, rather than a hub of power. 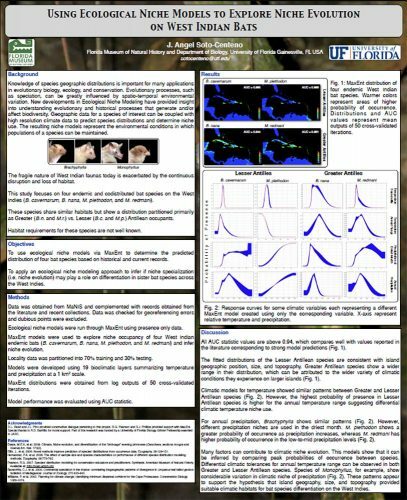 This poster presents the results of recent zooarchaeological analysis of vertebrate faunal materials from MC-6, a prehistoric site located on Middle Caicos, Turks and Caicos Islands. Eight vertebrate samples from 2 different contexts were analyzed: 2 samples recovered from within a stone “structure”, Structure IV, and 6 samples from the surrounding midden. Results indicate clear spatial distinctions in vertebrate processing (and presumed consumption) and deposition at the site, and suggest that the habitation of MC-6 may have been influenced in part by the procurement and processing of bonefish (Albula vulpes). Faunal materials from MC-6, an archaeological site located on the south-eastern edge of Middle Caicos, Turks & Caicos Islands, indicate that locations within this site were categorically distinguished from each other. At this site, conical stone structures were built into elevated midden areas (Keegan 2007, Sullivan 1981). In 2010, a FLMNH team conducted a six-week excavation project funded by NSF, specifically targeting these structures and middens to understand the internal dynamics of this village and how these structures related to the midden area (Morsink 2010). 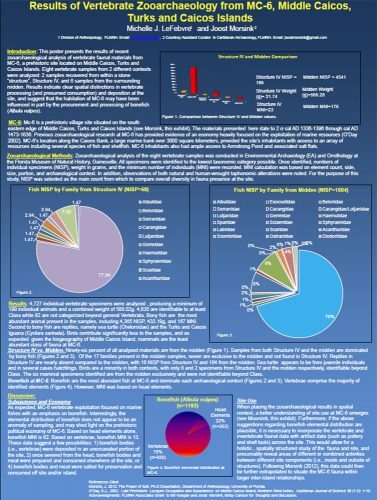 Zooarchaeological data from both contexts is presented here. This paper presents evidence for the production of cotton and henequen fibers based on archaeological evidence from CE-11 and CE-33–two Late Ceramic Age habitation sites at the former U.S. Naval Station Roosevelt Roads in Ceiba, Puerto Rico (Figure 1). Radiocarbon dates from both sites indicate occupation between ca. AD 1050 and AD 1450. 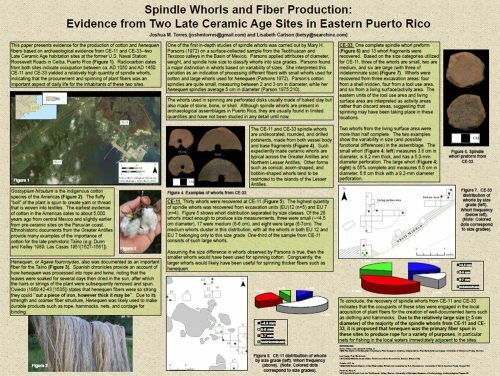 CE-11 and CE-33 yielded a relatively high quantity of spindle whorls, indicating that the procurement and spinning of plant fibers was an important aspect of daily life for the inhabitants of these two sites.